In this edition of the Main Menu, columnist Jan Main gives our readers some valuable tips on how to decorate and make Easter Eggs, just in time for this weekend’s celebrations. Eggs have long been a symbol of fertility and new life. It seems only fitting that they should play a key role in the festivities of Easter whether religious or simply a spring celebration. As an ingredient, the egg is a powerhouse of nutrition and essential in a variety of culinary dishes. It is a thickener in sauces, a leavener in baking, a binder in recipes but for Easter, eggs are all of these plus a centerpiece for the dining table. Enjoy this sampling, Happy Easter! Happy spring! Many people simply hard cook eggs and paint or dye eggs to decorate the springtime table. However, by blowing your egg, you have shells to decorate plus the egg to use in cooking. 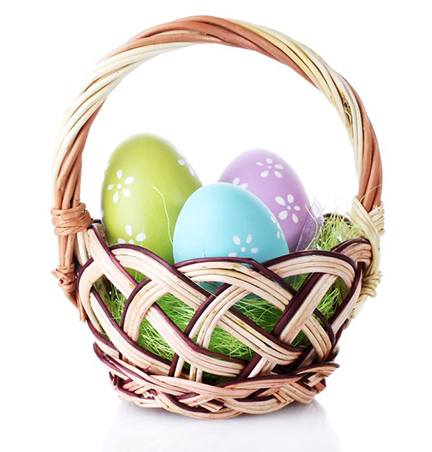 Usually, I start collecting eggs at the beginning of the Easter week to have a selection of egg shells to decorate and use in a colourful basket for a table centerpiece. Of course, it means that the egg itself is free to be transformed into a number of recipes. Wash the egg thoroughly with soap and cool water. Rinse well. Using a sharp needle and a firm but gentle grasp, poke a hole into each end of the egg. Blow through the one hole while making sure the egg is over a bowl to catch the dislodged egg. Catch the egg in this bowl; cover and refrigerate for these or other recipes or simply, scrambled eggs! Egg dye is available in dollar stores and drugstores. This is the ultimate springtime dessert ideal with any main course. It is fast, simple and ever-so-delicious! In a heavy saucepan over medium high-heat, whisk together 1 tbsp (15 mL) grated lemon zest, lemon juice, eggs and sugar until well blended and frothy. Continue to whisk steadily over the heat until thickened and bubbly around edge of saucepan, about 3-5 minutes. Once thick, remove from heat. Pour lemon mixture into a mixing bowl and place over a bowl of ice to cool. Meanwhile in a deep bowl or yogurt container, using an electric mixer, beat cream until stiff peaks form. Fold the cooled lemon curd into the whipped cream until an even pale, lemon yellow colour. Spoon into 4 to 6 serving dishes, sprinkle with remaining lemon zest; cover and freeze 4 hours or overnight. Yum! A perfect accompaniment to salmon, ham or lamb. It says spring! Break off the tough ends of asparagus. Cook in a large pot of boiling water 2-3 minutes. Immediately drain and rinse in cold water. Pat dry. Arrange asparagus in a single layer on a platter. Arrange the egg slices in overlapping rows on top of the asparagus. In mixing bowl, stir together mayonnaise, sour cream, mustard and dill. Zig zag dressing over asparagus and eggs. Serve with a bowl of the remaining dressing. Cover and refrigerate until ready to serve. May be made several hours in advance.